Driven by the work of the Turning the Key report commissioned by the Mental Health Commission of Canada, a number of supportive housing providers in Canada created a Social Finance Working Group in 2012. Their goal was to explore social finance opportunities in the supportive housing sector, and enable supportive housing providers to learn about and engage in alternative methods of financing to improve and develop new dedicated housing units in Canada. 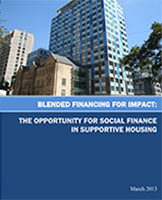 This report identifies and outlines a number of social finance models, identifies principles for an effective social finance strategy for the supportive housing sector, highlights challenges to further adoption of impact investing, and offers recommended actions to increase the supply of supportive housing through the use of social finance strategies.